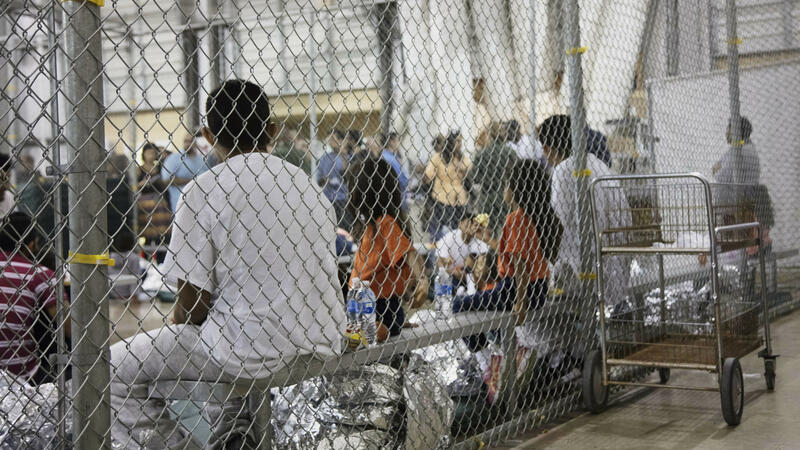 In this June 17, 2018 file photo provided by U.S. Customs and Border Protection, people who've been taken into custody on charges of illegal entry sit in cages at a facility in McAllen, Texas. A 2014 photo of the salon and commissary at the Karnes County Residential Center, in Karnes City, Texas. Karnes is one of the nation's largest detention centers for families caught crossing the southern U.S. border. Recent news stories have been filled with the joyous reunions of migrant parents who had been separated from their children at the Southwest border. Yet hundreds of families were reunited only to be detained again, this time together. Inside one of those detention centers in Texas, weary fathers are now staging a hunger strike to highlight their plight. One detained Honduran father — who declined to give his name fearing retaliation from Immigration and Customs Enforcement — was interviewed by RAICES, an immigrant advocacy group based in San Antonio. The audio was made available to journalists. "Everyone has agreed that we will stop eating. We are doing so because we don't know what will happen to us. We need to know if we will be deported or allowed to remain in this country. We are asking the government to free us. We are not criminals," he said in Spanish on a phone from inside the Karnes County Residential Center, an hour southeast of San Antonio. The nation's two main family confinement facilities are run by private, for-profit corporations for ICE. Reunited fathers and their children are going to the Karnes jail; reunited mothers and their kids are being sent to the South Texas Family Residential Center in Dilley, southwest of San Antonio. Immigrant advocates who work at the two facilities tell NPR that ICE has transferred more than 500 reunited families there in recent days. Immigration attorneys believe the government wants to put them on a fast-track to deportation. But federal judge Dana Sabraw in San Diego has slapped an indefinite stay on removals in response to a lawsuit against the government by the American Civil Liberties Union. So ICE cannot deport any reunited families for the time-being. There are not enough ICE detention beds in the country to detain all of the rejoined families. "There was a lucky group of parents who got reunified and released. 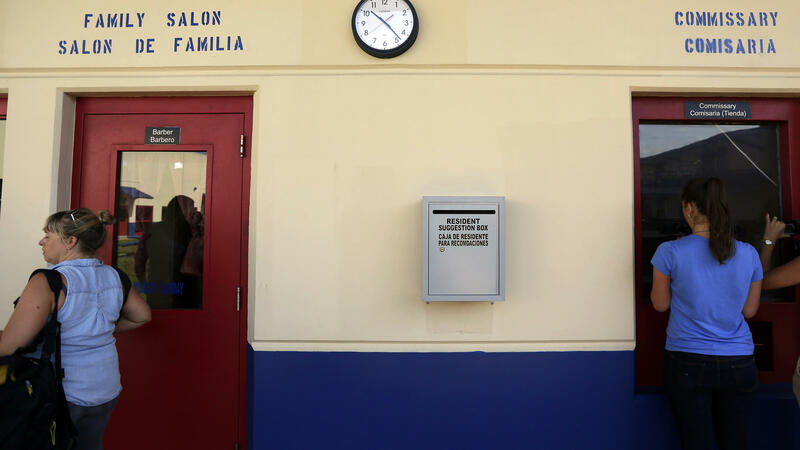 And then there was a group of parents who got put into family detention centers and there doesn't seem to be a rhyme or reason which group people fell into," says Kate Lincoln-Goldfinch, an Austin-based immigration attorney. ICE had no comment on the reported hunger strike at Karnes. A spokesperson said in an email to NPR, "This is not the first time RAICES has encouraged a hunger strike." Matthew Albence — the deportation chief at ICE — testified on Capitol Hill on Tuesday. He addressed criticism of conditions inside ICE's 'family residential centers' at Karnes and Dilley. "I think the best way to describe them is to be more like a summer camp," he testified, "These individuals have access to 24-7 food and water. They have educational opportunities. They have recreational opportunities. There's basketball courts, there's exercise classes, there's soccer fields that we put in there." Yet, four Central American fathers interviewed by RAICES described a hopelessness and desperation among detainees that no amount of recreational opportunities facilities would appease. "My son says to me he hasn't done anything to be incarcerated here. He says, 'Daddy, I am not a criminal,'" said the Honduran father who asked not to be identified. "We want to get out. He cries every day, he doesn't want to eat. He's only six years old." Some detained parents say they freely agreed to be deported in order to put an end to the separation nightmare. Others say they were coerced into signing voluntary removal papers, with their child used as leverage. "I was told that once being deported to Guatemala I would be reunited with my son at the airport," said another reunited father who is detained at Karnes, who gave his name as Olivio. He says he abandoned his asylum claim and signed removal documents in order to be with his son, who was removed from him for two months. ICE denies it used children as bait to coerce separated parents to agree to voluntary departure. The ACLU is asking the San Diego judge for an additional seven-day stay in order to give fathers like these held at Karnes more time to decide whether to change their minds and renew their asylum claims. Migrant fathers say their detained children will not participate in the hunger strike. For their part, they'll protest by refusing to take part in school activities inside of the detention facility.